Thanks for the update, Adam! Nice of you to tide us over until Josh posts next. In the meantime, in case anyone missed it, Josh posted the next Kickstarter update. It's basically a review of the past two months of Dev Logs, which makes sense as not everyone who backed the kickstarter is going to read the dev logs. I like the "2 months in review" perspective. 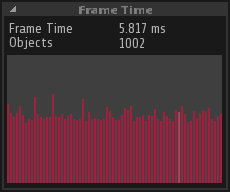 It's a pretty simple real-time graph but it's fun to watch. Especially in person where it's buttery smooth. It's showing frame time on my laptop with a populated system in the above gif. Note that the jittery times are from the recording software. Normally it's reasonably flat on this machine (and so smooth you can't even see the variations on my desktop). That's the last UI thing for a while I think. Next I'm looking to implement a more serious gameplay feature. So I'm taking votes! Let me know what you think would be a good foundational piece of gameplay to implement. inventory management/equipping ships, market, missions, formations, news ticker...? I would be interested in seeing Executive and worker NPCs implemented back into the game, along with everything else that once existed. My 2cents would be to look at NPC events. Specifically how events are generated. This will drive many aspects of core gameplay including player quests, npc interaction, etc. Arrr, mateys, methinks ye landlubbers ought ta git yerselfs workin on ye olde AI code and go from there. Else yon scalawags will have ye walkin' the plank. Where's the rum, me hearties? Thanks for these notes, Adam, and for the invitation to comment on next steps. Nested projects -- or, as Josh once described it, "macro-level AI." I see projects as the necessary architectural framework for all goal-driven gameplay beyond local/immediate pew-pew fun. So I'm inclined to think it's worth prototyping now. Alternately, note that in this poll not a single person was willing to cut factions or asteroid mining to get LT shipped sooner. So maybe there are some clues about the interests of likely players of this game. Get mining back into the game. From the sounds if it, mining is currently missing, and that is the first step towards industry, which is the first step towards a living universe. It will also give any AI tests a civilian population to hunt when acting as pirates, or to defend when acting as police. I thought that's what we were supposed to do today anyway, it being "talk like a pirate" day and all. ...Ah, wait, you're in NZ so it's already the 20th for you, isn't it. aren't we due for a dev log? That's why AdamByrd has been posting. To keep us from feeling like the devs are dead. Get mining back into the game.